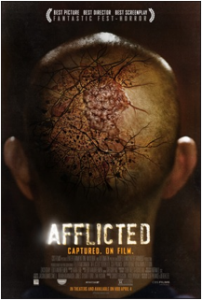 Afflicted isn't your ordinary "found footage" film in that it's actually one that's good. It doesn't follow the conventional structure of FF offerings, it's brimming with ambition and it's a smart take on vampirism. This inventive breath of fresh air is the product of Derek Lee and Clif Prowse's friendship and efforts. The two wrote, directed and star in the film and play, well, Derek and Clif – best buds who go on a globe-trotting adventure until Derek has a bloody encounter with a woman and subsequently goes through a monstrous transformation. The film was shot in various European cities and on location. For a low budget film like this – and for what they pulled off – it's an ambitious feat. I met these two in Austin, Texas shortly after the film played to Fantastic Fest audiences. I've been waiting for the release to finally post this and with the film arriving on VOD and in select theaters this Friday from CBS Films, now is a good time. Ryan Turek: The audiences that you're sitting in with, are they responding to the horror, the action, the friendship that's on display in the film? Derek Lee: Most consistently, it's the action. Clif Prowse: Yeah, the POV stuff. Turek: Now, you two have had a long friendship in real life, just as it's portrayed in the film, right? Prowse: Yeah, we met in the eight grade and we'd make our own movies. We got our parents cameras and started making these little action movies. Then years after school, we questioned is this something we're passionate about and can we do this professionally? So, we started making short films and directed four of those. I've done a few productions and worked alongside other directors and learned their process. Lee: I've been active in the film industry, working on shorts and trying to make ends meet between them. Towards the end of the shorts we were all working on, they were getting a bit bigger because, technically, we wanted to keep pushing the boundaries. Our crew for Afflicted was anywhere between four and 14 people a day. On our last short, I think we had 60 people because it was a three-camera action movie with a stunt team. It was huge. Afflicted was almost like going back to our high school days with us going, "Okay, you take the camera, get this shot" and just trying to get the footage you need in the time you have. Turek: How did you pull this one off? Did you play by the rules and get permits to shoot openly in the streets or was this more of a guerilla effort? Lee: We didn't push it in Vancouver where we filmed our party stuff, same with Barcelona, there was nothing too extreme there. Italy, rural Italy, the people were so receptive and the mayor was super cool and I think they gave a little bit of money to us. We also got an ambulance. Then there's Paris. If you're an indie or a Hollywood production, you're in trouble, you just have to pay for it. We just figured it out. A big thing was using local help. That's what I recommend, find local help. Prowse: One of the things that was important to us, though, was that in a lot of found footage movies, the execution can outweigh the characters. They can be strong and scary, but if you had to describe your personal connection to the character, it might be difficult. So, hopefully, we tried to enhance that so you like these guys heading into the story so it makes more of an impact. Lee: We wanted to keep the story as small as possible, but the scope… We had to give you just enough of Derek's story, just enough lore – you could crack this story open and go so much bigger with 'Are there others?' because it would destroy the budget. We had to keep it about the character. And, as a result, you have a nice sense of claustrophobia as well. You're seeing someone go mad with this affliction and this disease. Prowse: As first-time filmmakers, the original script we wrote was a bit too complicated. We needed to get to the meat of the story. Turek: For you, Derek, you're taking on a role that's physically taxing. Talk about the body language you adapted to as you made your transformation? Lee: That cost me. It was exhausting. The adrenaline is going twice is much. We're doing our first feature. You have a reason to wake up in the morning already. Physically, what we learned is that Italy during the winter is extremely cold. [laughs] When you're half naked all of the time, running around and snarling like an animal is tough. Ultimately, it was trial and error until we got the right depiction. We wanted something more biological than fantastical. There was one scene that was extremely physical and very emotional, and we had this blood cannon and a limited amount of takes. It was tough. Prowse: Derek got into really good shape before we went on this shoot and we were working with stunt professionals. He was incredibly dedicated and I counted on that. [laughs] He was really giving it everything he had. Prowse: If people don't like the movie, it's our fault. Turek: You said earlier, you were avoiding the fantastical element with vampires. Can you talk a bit about that decision? Prowse: It's a fantasy-based genre. The vampire genre is romanticized, cinematic and melodramatic, usually. 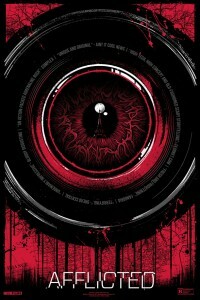 They're sprawling and stylized and that's why we thought the found footage element could turn it on its head. Pull all of that stuff out. Root it. Reimagine it so we don't have to hit all of the usual tropes and rules. If this were to happen, what would it look like? Lee: It all goes back to the curse element. How terrible would this be? You can't eat animals. No synthetic blood. No excuses. You're tormenting your character on a weekly basis, how would they handle it? And what horrific things would they have to do? There's much more that you can do with all of this. The fellas told me that they're currently writing away on another project. Something steeped in the sci-fi/horror realm. 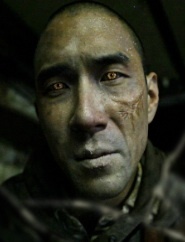 And, should Afflicted take off, they have story ideas for a sequel (naturally).